What signal(s) did SwingTradeBot give when the move began? If there were no signals, can I create one to catch a similar move int he future? If there were signals, why/how did I not take advantage of them? I want to share my study process for doing that kind of research as well as show how you can use the signals to get help catch moves like this. I'm often asked which signals are the best and my answer is always "it depends". Part of what it depends on is what type of trader you are. So doing this type of research can help you to find what signals you're comfortable with. 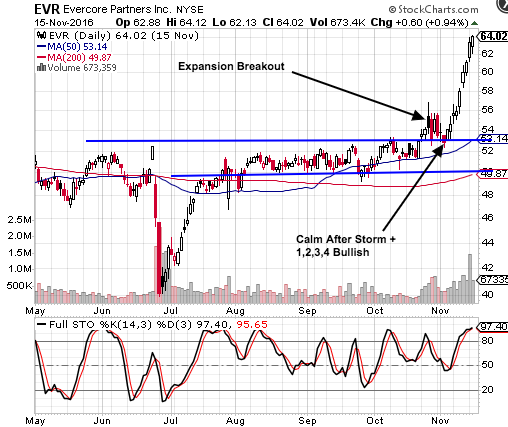 I'll start by examining the action around the beginning of EVR's move. So it triggered an Expansion Breakout (EB) signal and made a Wide Range Bar (which is a little redundant, given that the Expansion Breakout has to have a wide range) What stands out to me is the combo of an expansion breakout, high volume and breaking out from a long sideways consolidation. I check the Expansion Breakout scan almost every day, so I see a good number of Expansion Breakouts but not so many from a tight, sideways consolidation. One thing to note here is the trading rules for an EB -- note that you should buy ABOVE the high of the EB day. So if you're comfortable with that (I tend to prefer pullbacks), you could have entered an order (see my post about order types). It would not have triggered the next day, so no harm, no foul. So if you still like the stock, you could add it to a watchlist in order to be updated about it as it triggers more setups. 2. Even if the signal were confirmed by a more lower, I think it's likely that it would just go back to being range-bound. 3. All its trends (short, intermediate & long-term) were UP. I'll heed to the prevailing trend(s). So over the next few days there were some range contraction alerts, which should be taken as a bullish sign -- they show that the stock is consolidating its gains while managing to stay in breakout territory. But things get interesting on November 2nd. We get a combo of two of my favorite signals: Non-ADX 1,2,3,4 Bullish and Calm After Storm. Based on the Non-ADX 1,2,3,4 rules you could have entered an order to buy 10 cents above the Nov. 2nd high. You would have been filled on the next day around $54. The stock was off to the races since then. It's up around 45% since that entry point. 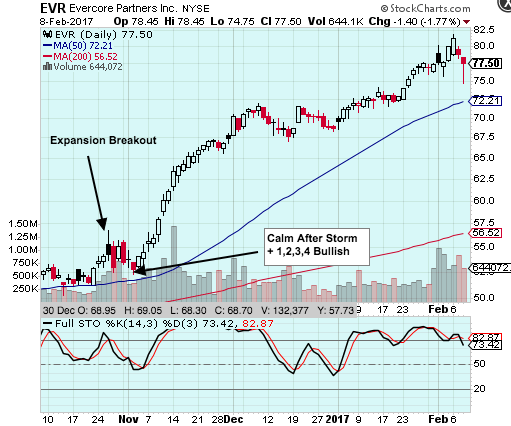 The site hasn't issued a single bearish signal on EVR since then. I need to pay more attention to the EBs from long consolidations -- I've created a special watchlist for recent EBs of that type. Of course not every signal is going to work out this well. But the idea is to catch enough trades like this to pay for some small losers which will inevitably be in the mix. But, again, I wanted to show a process of researching which signals might work well for your trading style.